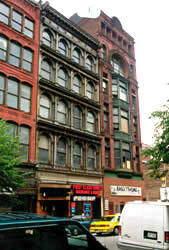 The storefront is usually the most prominent feature of a historic commercial building, playing a crucial role in drawing customers and increasing business. 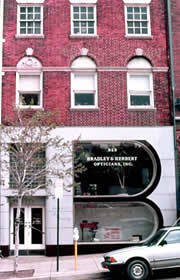 It is not surprising that the storefront is the feature most commonly altered in a historic commercial building. Many alterations have completely changed or destroyed the distinguishing features that give the storefront its historic character. Appropriate new designs for missing or substantially altered storefronts must take into account remaining historic elements of the storefront and the relationship of the storefront to the historic design elements of the façade above. 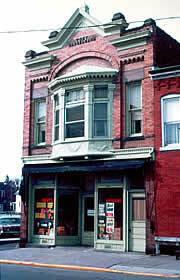 Preserve the historic character of the storefront and overall building. Retain and preserve remaining functional and decorative historic features, such as display windows, signs, doors, transoms, lower window panels, and cornices. Retain later storefronts that have acquired significance. Replace deteriorated or missing features based on remaining physical evidence. Identify the remaining physical evidence. Use this information to determine the size and pattern of transoms and location of the historic entrances. Evidence uncovered during investigations may help provide the necessary documentation to design an appropriate storefront. is a new use on the inside. When the use of the building changes from commercial to residential, the large display windows still need to be retained. To provide privacy, shutters recessed behind the display area, simple curtains, or interior blinds may be considered rather than altering the existing historic storefront.